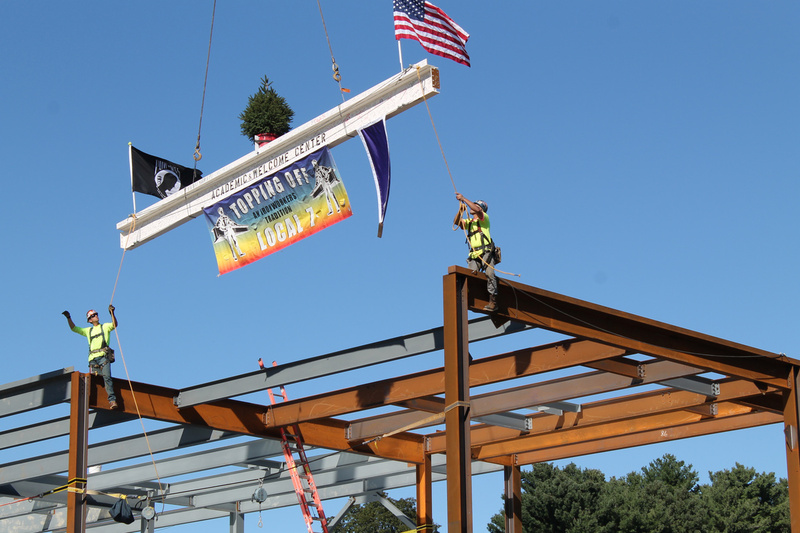 (Providence, RI) – BOND, the Northeast’s premier building, civil, utility and energy construction firm, recently celebrated the topping off of Stonehill College’s Academic & Welcome Center. The ceremony marked the last steel beam raised on the new facility, designed by S/L/A/M Collaborative. It was attended by the Stonehill College community, the BOND project team and design partners. BOND is providing preconstruction and construction management services for the 35,000 square-foot Academic & Welcome Center, built on the site of the Old Student Union. The Center will feature state-of-the-art presentation rooms, administrative and faculty offices, a 350-seat auditorium, classrooms, meeting spaces, a bookstore and an Au Bon Pain Café. The new Center will serve as a welcoming focal point to the College, offering students a wonderful introduction to the campus, as well as demonstrating the value of a Stonehill education. It’s also the cornerstone building of a series of improvements to the academic quadrangle. The project is slated for completion August 2018 in time for the academic school year. In addition, BOND is working with the College on the pre-construction design of the Leo J. Meehan School of Business, which will begin construction in Spring 2018. Both of these projects are being managed by BOND’s Providence office team, whose leadership has been instrumental in building a strong relationship with the College. Some of BOND’s past projects on campus include: the Rev. Mark T. Cregan C.S.C. Athletic and Fitness Center at the Sally Blair Ames Sports Complex and the Thomas and Mary Shields Science Center. Stonehill is a selective Catholic college located near Boston on a beautiful 384-acre campus in Easton, Massachusetts. With a student-faculty ratio of 13:1, the College engages over 2,500 students in 80+ rigorous academic programs in the liberal arts, sciences, and pre-professional fields. The Stonehill community helps students to develop the knowledge, skills, and character to meet their professional goals and to live lives of purpose and integrity.